This new Directshow filter was initially developed for webcamXP / webcam 7 in order to support as many cameras as Netcam Studio and to reuse the fantastic decoding engine since it works so well in Netcam Studio. 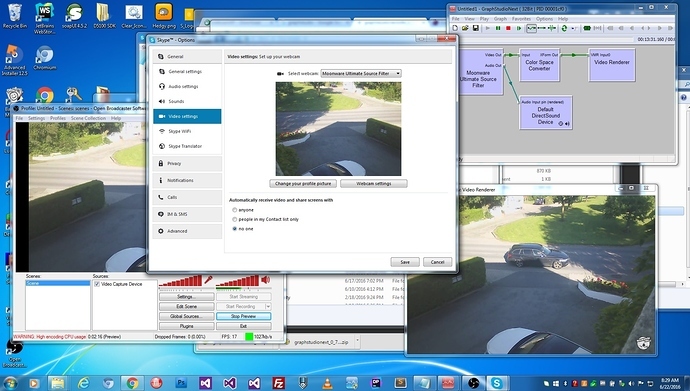 This was done successfully and for a few months the RTSP support in webcamXP and webcam 7 is also almost perfect so it was time to extend this so that it can be used in other applications as well. 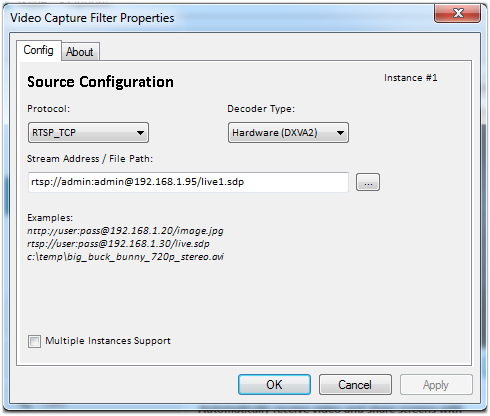 This does not require to have webcamXP or Netcam Studio running, it’s totally independant. Only the free version is available at this stage which will display a small Moonware Studio logo in the corner (apart in webcamXP or webcam 7). It will soon be possible to buy a personal or developer license in order to remove this limitation of the free version. The current package is 32-bit only but we can easily compile it in 64-bit so the 64-bit version will be released shortly as well. It doesn’t include the templates so you need to know the url to access the streams. Feel free to report in which applications it works or not (but do not use this topic to request help regarding how to configure it, please create a new topic for this if needed). Start Skype or the application in which you want to use the filter. Click on Configure Webcam Settings if you use Skype to modify the settings for the video stream. First things first - thanks for a great piece of software. You cannot imagine how many hours of try and error I spent before I finally found this page! Question - what happened to the Audio Out? Many cameras have dual audio, but these do not seem to be transferred through MUSF. Any chance to have virtual microphone and speakers on top of the virtual camera? MUSF, WebcamXP and Netcam Studio have never had an Audio out. Only Audio in for listening is available. Usually, the audio out features is with the use of their own apps. The streaming protocols are only one way so how to solve audio out I do not know. I will send this to our developers to get an answer. From a practical point of view, I just want to use camera’s microphone in Skype. Is it possible now (and I’m just ignorant) or would require some extra development in MUSF ? Hehe, you are absolutely correct In the installations I have with MUSF I have only the tabs for Config and About. I have never seen the last 3 tabs. I just tested in different programs and they all act the same. In Skype I only have the laptop microphone for the audio and not the MUSF. I am not sure if that is an old version on top. I have to forward this as well. When I paste rtsp:// URL into VLC it plays video with audio, that means that my camera sends both. My question was if MUSF can create two devices - one for video (as it is today), and one for audio that would read from rtsp://. I am also dreaming to have virtual microphone driver to send audio to the camera but that is probably not possible with rtsp:// and requires manufacturer’s drivers. I will nag Foscam for these. I contacted our programmers about the MUSF and audio. 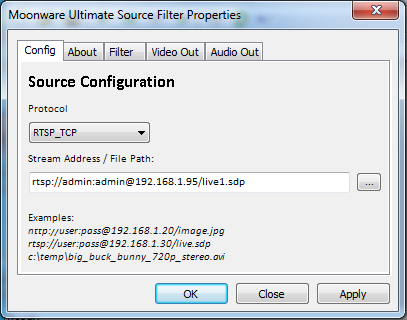 Video capture source filter is a special software with a special format of the audio output. All programs like Skype do not accept that audio format. Why, I do not know. Yes, your camera delivers real time video and audio in the compressed format h.264 in the streaming format rtsp. The MUSF generates two outputs. One for video and one for audio. Both the video and audio is handled by for example NCS. The audio after NCS is handled by the computer. Another software/hardware can probably take that audio stream to another application. To send audio to the camera is something else and rtsp is not used since it is one-way. Usually http is used and some port (80). How that is done is up to each camera manufacturer. Thanks! This is what I’ve been looking for! Could you please upload the 64-bit version? There is only a 32bit available since a lot of used resources still are only in 32bit. What is the latest version of MUSF? At this topic version is 4.5, but I’v found v5.4 at the forum. And how can I purchase MUSF to remove a logo? is there any clue ? The filter itself do not flip the image. It depends on the application you use the filter in. I think the Moonware source filter is great as far as Microsoft did not launch other OS than Windows 7. In windows 7 times, the default os primarily supported 32-bit system, but in windows 10, it is 64-bit even if it still supports 32-bit softwares. The skype in windows 10 is 64-bit software, so does not include 32-bit directshow source filter. 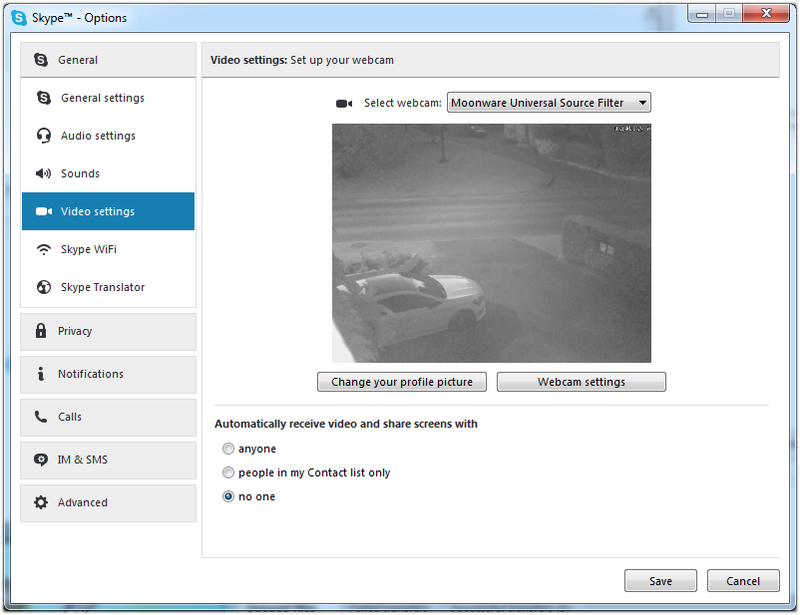 Moreover, the webcam property window in skype software does not show up where Stream Address is specified. Finally, I want you to do start the 64-bit’s Moonware directshow source filter and test it on Windows 10 environment. Thanks for info. I tested on Skye and you are correct.